Is your landlord planning to redevelop? 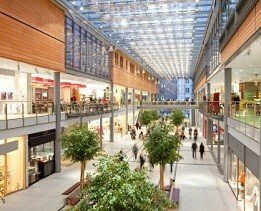 Redevelopment of shopping centres is a hot topic at the moment. In the Sutherland Shire, Westfield Miranda have officially announced their plan to redevelop the Shire’s major shopping centre. Some leased premises have already been vacated to make way for the major overhaul, with more moves and changes on the way. The Kareela Shopping Centre redevelopment is also currently underway, with the result being that some shops have left the centre all together to make way for the demolition of buildings and part of the carpark. Some shops, such as the chemist, have been relocated. 2. At the end of the lease the landlord will not offer a renewal and terminate the lease (where there is no option and the landlord is within their rights to do so). • The requirement that the landlord give you adequate notice of any redevelopment. • A right to occupy another premises within the centre whilst it is being redeveloped. • A right to know that you may occupy premises for a period of time before any relocation or redevelopment notice is served on you. • Appropriate rent and outgoings reductions if the premises that you are relocated to is of an inferior standard. • Payment by the landlord of your costs in relocating (both to temporary premises and to the new permanent premises). • Adequate time to relocate should a redevelopment notice be included in your lease and be served upon you. • The right to terminate the lease in the event that you do not want to remain in the centre during the redevelopment. In many instances the landlord will hold a lot more negotiating power and you will not be able to include all of the provisions you would like in regard to any proposed redevelopment. However if you are well informed of the consequences of any redevelopment clauses you can make an informed decision about whether the proposed lease is right for your business. Make sure you receive adequate advice in regard to your lease and the potential consequences on you and your business, contact our Commercial Business & Property Team today.